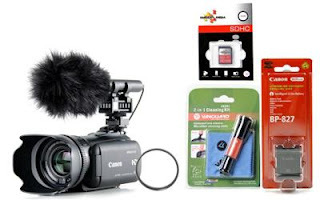 Packing in every feature a video enthusiast could ask for, the VIXIA HF G10 Flash Memory camcorder is Canon's new flagship consumer camcorder, providing the ultimate in HD video performance and quality. Incorporating a 32GB internal flash drive, as well as dual SDXC-compatible card slots, it delivers exceptional storage capacity. Recording Full HD 1920 x 1080 video, the VIXIA HF G10 features a Genuine Canon 10x HD Video Lens (35mm equivalent of 30.4mm – 304 mm) with an 8-blade iris for smooth background blur and a dedicated manual focus ring for enhanced control. The VIXIA HF G10 boasts Canon's HD CMOS Pro Image Sensor which provides outstanding video resolution, superb low-light performance, and a wide dynamic range. The 3.5-inch High Resolution Touch Panel LCD provides a large, crisp display, and easy menu navigation. And advanced features such as an improved built-in microphone, Native 24p recording, Cinema-Look Filters, and full manual control provide the discerning user with an extensive level of creative management. The VIXIA HF G10 allows you to record up to 12 hours of clear high definition video to a 32GB internal flash drive or to two SDXC-compatible memory card slots. 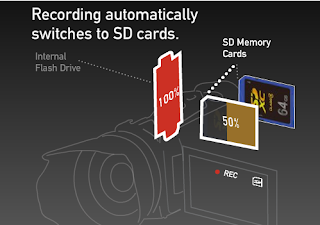 With Relay Recording, the camcorder automatically switches video recording from the internal drive to the SD memory cards when the memory becomes full. 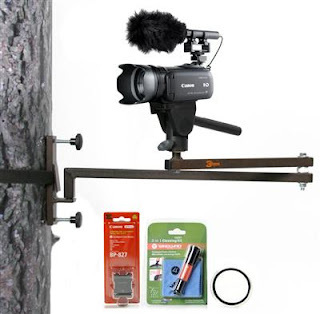 No need then to worry about running out of recording time during a thrilling, once-in-a-lifetime shot. 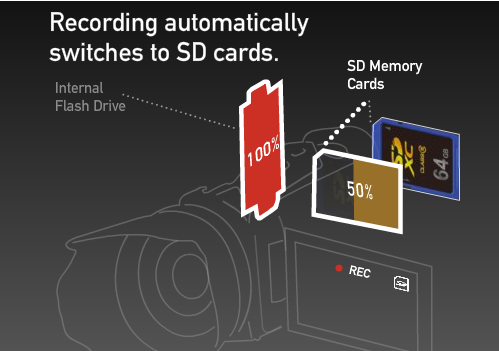 With SDXC memory card compatibility, you’ll have card storage capacity from more than 32GB up to 2TB and ultra-fast data transfer speeds. Incorporating a technology proven in Canon’s professional level camcorders, HD CMOS Pro is a 1/3” native 1920 x 1080 image sensor which delivers outstanding video resolution, superb low-light performance and a wide dynamic range. Unlike image sensors found in competitive consumer camcorders, HD CMOS Pro uses fewer pixels, which are significantly larger (61 percent)* and more sensitive, resulting in optimized video performance. Since the effective number of pixels of HD CMOS Pro is equal to 1920 x 1080, resizing is eliminated, allowing Full HD video to be captured and recorded with professional precision. Because each individual pixel is larger and more sensitive, each is capable of capturing more light, allowing high quality video to be achieved even in dimly lit conditions. 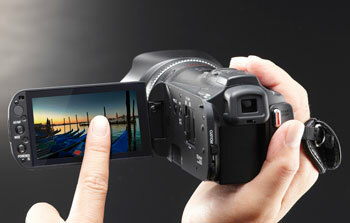 The sensitivity of HD CMOS Pro is approximately 25% better than the Full HD CMOS sensor in the 2010 VIXIA HF S-series. A larger pixel area also allows more light to be stored, resulting in 280% improvement in dynamic range for exceptional reproduction of both highlights and shadows. *** Skin tones are captured in a finer gradation, and stable gamma and Auto Exposure control is also achieved resulting in a more ‘lifelike’ image. 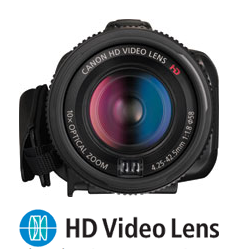 The VIXIA HF G10 features a Genuine Canon 10x HD Video Lens which offers a 35mm equivalent of 30.4mm - 304mm. It delivers unsurpassed image quality, the versatility of a wide angle of view and smooth and professional looking background images thanks to a sophisticated 8-blade iris. The professional touch of a dedicated manual focus ring allows accurate and precise control. Combined with Canon’s Exclusive HD CMOS Pro Image Sensor, it captures video with stunning resolution, superb low-light performance, and a wide dynamic range. Canon’s DIGIC DV III Image Processor provides stunningly realistic color and sophisticated noise reduction for exceptional low-light performance. It is also the high-speed engine that powers a variety of Canon technologies including Smart Auto, Touch & Track, Genuine Canon Face Detection, and Cinema-Look Filters. 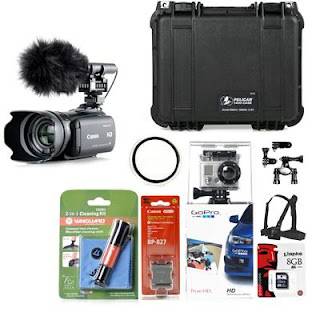 You will also find that exceptionally lifelike tone and detail are captured thanks to 24Mbps Recording, which offers the highest bit rate in AVCHD. The VIXIA HF G10 not only captures images in Full HD, but records and outputs at 1920 x 1080 as well, so you get Full HD from lens to screen. And with Tele Macro, the VIXIA HF G10 automatically zooms the lens to the telephoto end and sets the minimum object distance to approximately 1.3 feet (from 3.3 feet) giving you the opportunity to shoot spectacular close-ups with the dramatic look of shallow depth of field. Tele Macro is one of 38 scenes available in Smart Auto Mode. The VIXIA HF G10 features Canon’s proprietary Dynamic SuperRange Optical Image Stabilization which provides continuous adjustment throughout the entire zoom range to correct a broad range of motion. 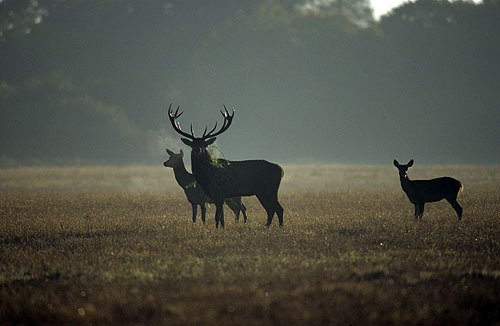 Extra compensation is applied at wide-angle focal lengths to eliminate unwanted shaking which is common when walking. Together with the latest development, Powered IS, you’ll find an even higher level of compensation for subtle hand movement at the telephoto end of the zoom range. Powered IS can be engaged by pressing or holding the Powered IS button on the Touch Panel LCD. You will see extraordinary detail with this large, stunning 922,000 dot screen which also provides approximately 100% coverage of your shooting scene. 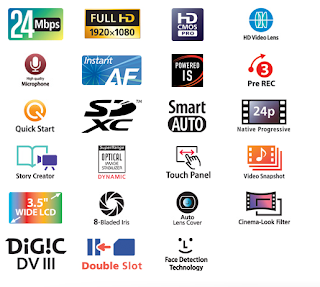 It delivers brilliant color combined with touch panel control for faster and easier menu navigation. You’ll also have Touch & Track, which allows you to get precise focus and exposure on any subject - whether it’s people, pets, or vehicles, by selecting your choice right on the Touch Panel LCD. To provide an exceptional level of control over the components of the video you shoot with the VIXIA HF G10, you will find a range of shooting assist functions normally only available to professional videographers. Tv/Av: Use the dial to adjust shutter speed (Tv mode) or aperture (Av mode), as needed. In this mode the key has no effect. 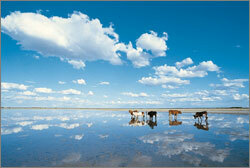 Manual exposure: When manual control is selected, the dial can adjust aperture, shutter speed, or gain. Select items to adjust, such as aperture or other settings, with the key. 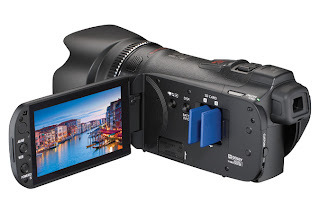 To further enhance focusing capability the VIXIA HF G10 also features Focus Assist. It includes enlargement, which helps in capturing your subject in razor-sharp focus. It works by providing a 2x magnification of your subject, which is automatically cancelled when you start recording. This is a feature normally found in professional broadcast-quality cameras. Also included is color peaking, which shows the shooting object’s focused areas in actual colors. With Canon's Edge Monitor Focus Assist system, a green monitor is shown at the bottom of the LCD Display. The green waveform shows overall focus of the image, and the height raises to indicate the area in focus. Through this dynamic focus feedback, you can intuitively tune focus in a scene and quickly change the zone of focus. Typically only found on expensive external units, the VIXIA HF G10 has a waveform monitor built right into the camera. The waveform monitor shows a detailed view of overall image brightness. Enhanced zebra pattern (70% or 100%) indicates ‘blown out’ or high brightness areas to help you set the proper exposure. 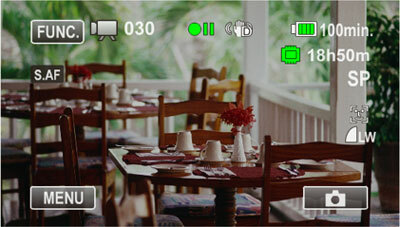 With the Level Marker feature, it's easy to keep your camcorder level for more professional looking shooting. Line up any horizontal lines in your shot - such as the horizon - to the marker and you can be sure your camcorder is level. The Grid Marker helps you compose your shot accurately, by referencing a grid in your viewfinder. Depending on the background color of your shot, you can choose between two different colors for better viewing contrast. The VIXIA HF G10 features full manual exposure, as well as aperture priority (Av), and shutter priority (Tv) modes. The white balance control has 6 available presets settable through a variety of day and artificial light conditions (Daylight, Shade, Cloudy, Tungsten, Fluorescent H, Fluorescent), as well as two manual white balance settings. Color temperature may also be manually set from 2,000K to 15,000K in 100K increments for more precise adjustment. Advanced Video Snapshot allows you to capture the highlights of a once-in-a-lifetime trip or a family milestone with the same ease as taking photos. Simply record a series of short video clips – or select your favorite clips while in Playback Mode – and blend in your favorite background music to create an exciting movie that will grab everyone’s attention. This version of Advanced Video Snapshot allows selectable recording time (2, 4, or 8 seconds). 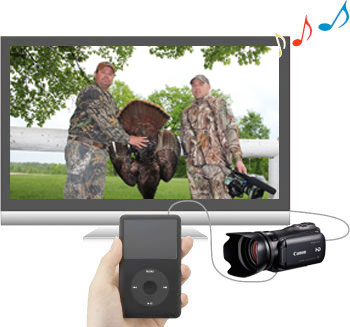 Additionally, audio from an external source such as an MP3 player can be played along with the Snapshot movie, and playback can be controlled from that source. 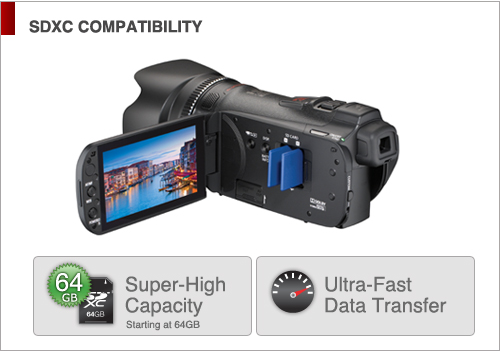 The VIXIA HF G10 is compatible with the Eye-Fi SD Memory Card. It’s possible to wirelessly transfer your video and photos to your computer, or upload them directly to online sharing sites in a few simple steps. Insert an Eye-Fi SD Memory Card into the SD card slot on the camcorder, configure your computer to select the target site (e.g., Facebook, YouTube, Shutterfly, Flickr) and you’re ready to share your standard definition files with family, friends, and the world! Canon camcorders are not guaranteed to support Eye-Fi card functions, including wireless transfer. In case of an issue with the Eye-Fi card, please consult with the card manufacturer. The use of Eye-Fi cards may not be approved in all regions, or from one region to another; please contact the card manufacturer for status of approval in the country/region of use. The VIXIA HF G10 boasts a host of shooting modes which give you creative options rare in a consumer camcorder. In addition to Normal mode, three other modes offer a range of opportunities to give your video a truly cinematic look and feel. 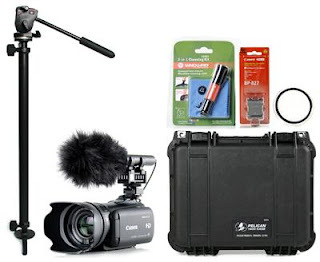 Native 24p Mode, a feature generally found only on Canon’s professional camcorders, allows 24 frames per second to be captured and recorded (instead of the standard 60i) – a must for serious filmmaking work. 24p Cinema Mode enables all aspiring moviemakers to achieve a professional "film-look." You can change the camcorder's frame capture rate to 24p (recorded at 60i), which provides the appearance of the same frame rate as movie film. In addition, you can use the VIXIA HF G10's CINE setting, which changes the color and tonal characteristics, evoking the look and feel of a movie shown in a theater. For added flexibility, these settings can be used together or independently. You would normally have to look to professional video cameras in order to have a sophisticated tool like 30p Progressive Mode at your command. 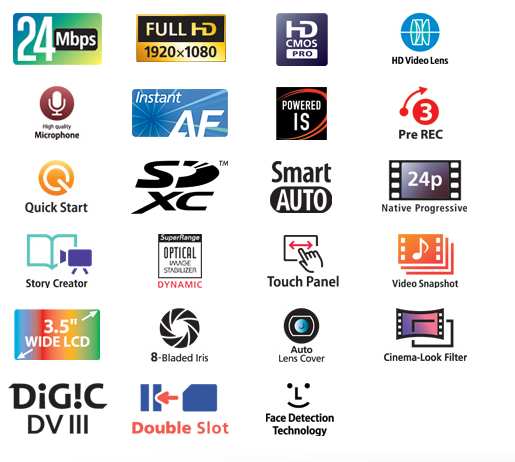 In addition to the standard interlaced video frame rate of 60i, you may choose to set the VIXIA HF G10 to capture video in 30p (30 progressive frames, recorded at 60i), which is particularly useful for footage to be used on the Internet. 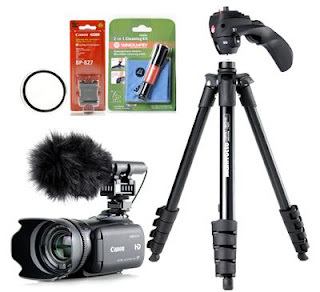 Excellent for action and sports shots, this setting gives enhanced quality to still images captured after recording. To maximize the usefulness and versatility of the VIXIA HF G10, you’ll find a range of terminals to extend the capabilities of your camcorder. A supplied HDMI cable offers easy, one-cable connectivity to your HDTV. The HDMI terminal also supports CEC and x.v.Color*. The camcorder converts 1080i in which the video was shot into HDTV format 1080p through the HDMI Terminal. The Mini Advanced Accessory Shoe allows you to attach optional Canon accessories, such as the VL-5 Video Light, DM-100 Directional Stereo Microphone or SM-V1 5.1-Channel Surround Microphone. The built-in Microphone terminal with manual audio level control and Headphone terminal provide exceptional audio flexibility. A built-in remote control terminal (compatible with LANC protocol) provides an easy connection to both Canon and third party wired remote controllers. The Canon VIXIA HF G10 is now available in our Packages!! Item Reviewed: Canon VIXIA HF-G10 9 out of 10 based on 10 ratings. 9 user reviews.